That moment when you FINALLY find a picture of what you'd like to do with your car. 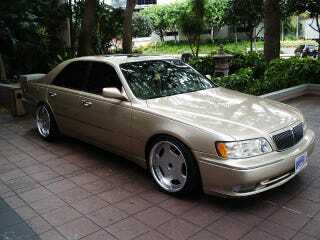 Most lowered Y33 Q45s are a little too extreme for my taste. This one though is just right. No crazy camber or oversized wheels and the driving height looks functional (enough). These are 19s and it’s been lowered on Megan racing coils. DIY lowering these cars used to be impossible until Megan and BC started selling kits for them WITH the steering spindles you need to change when you lower them already attached to the shocks. Lowering these required welding a few years ago, but now that isn’t the case, which is awesome. It’ll be a big undertaking, but my friends and I have installed multiple coilover kits at this point, and we’re about to tackle lifting one of their rusty old XJ Jeeps. There are a few more cosmetic things I’d like to take care of first, but I really want to do this. I’d probably be keeping the stock wheels/tires on when I install the suspension, so it won’t be an instant transformation from dad spec to conservative VIP treatment, but just lowering it will be a huge victory. Before that though I’d like to address my rusty trunk and the section that’s missing from my lower front valence. Easier said than done. I ordered a pre facelift trunk from ebay for $240 with free shipping, which was awesome. It’s totally fucked though and I’m in the middle of tearing it apart. That project will be my first foray into attempting to properly address rust and do a respray. I’ve done halfway decent rattle can jobs before, so I figure if I grab a basic HVLP setup and practice on the spare body panels I have lying around, I can get to the point where I’ll be able to lay down a decent color match/smooth coat. The pre facelift trunk includes taillights that “finish” the shape of the outer tails you see here, kind of like a previous gen Mercedes E class. So this will require wiring too since at the very least I’ll need the reverse lights to work. The missing section of my lower front valence is also a problem. It’s recessed so it isn’t that noticeable, one of my friends had no idea that was even an issue. I’d still like to fix that though, but that’s nowhere near as much of an undertaking as the trunk.